A magnificent approximate 3.7 acre ocean bluff property on Marina Drive is the setting for this awe-inspiring contemporary compound where a sophisticated design and construction process has resulted in a home of incredible luxury and comfort; where ease and elegance of living is paramount. 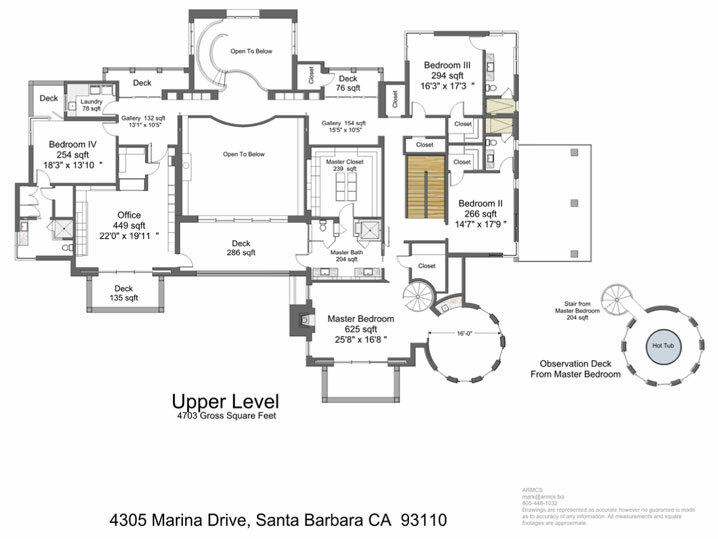 Designed by the Warner Group of Montecito, the architectural integrity of this wondrous estate is without peer, and offers a dramatic contrast to the Tuscan villas and Monterey Colonial architecture that have long been the dominant design ethos of Santa Barbara. Through white pillared gates, the entry drive lined with mature olive trees descends to the motor court that is pleasing in its understated sobriety and minimalism. Arrow straight walls of brilliant white plaster, accents of clear grain cedar, and a steel panel roof set the tone of contemporary grandeur for this residence. A long travertine paved “bridge” anchored between two bubbling reflecting pools leads to the formal entry. A soaring atrium rises to an organic shape recessed ceiling, where imaginative global periwinkle chandeliers float above the dreamlike space. A gracious metal staircase ascends from the Entry to the second level. Travertine floors that were cut specifically for the size and scale of each room flow seamlessly into the Living Room where a spectacular Simon Raab aluminum and polymer sculpture dominates the fireplace wall. Brilliant blues, greens and browns portray the Santa Barbara coastline and Channel Islands. Tall shelves on each side of the fireplace create interesting display areas for books and objets d’art. Magnificent views along the 204’ ocean bluff are framed by a 10’ wall of glass that disappears into concealed pockets and opens to the sprawling back gardens where stone terraces, sweeping lawns, gravel pathways, meticulously planted beds of lavender, succulents and century old olives lend a cool sophistication to the grounds. The square shape living room is of superb proportion. Natural light cascades into the room from a second level deck that spans the ocean side façade and heightens the room’s ethereal atmosphere. Invisible speakers in the Living room walls are imperceptible to the human eye; their extraordinary sound enhanced by additional sub woofers. The formal dining room adjoins the living room and profits from views to the north and is imbued with a restrained ambiance well suited for evening dining. Enjoyed from both rooms is a spectacular double-sided salt water aquarium, where the ballet-like performance by delicate jelly fish continues uninterrupted on the gently moving currents. The Family Room/Kitchen and Bar are located steps from the living room and enjoy panoramic views across the terraces to the pool area and fire pit and outdoor seating area. As in the Living Room, a wall of glass appears to be one continuous, uninterrupted panel due to minimal metal reveals that seem to make the wall disappear. Windows and doors throughout the home are of exceptional quality; many fabricated by Amari and imported from Austria. The Family Room features a sitting area with fireplace and large wall mounted HD screen television. An exceptionally inviting bar with counter seating is well equipped with refrigerator, freezer, ice maker, beer tap and dishwasher. As the bar has its own television, this is the perfect place to enjoy a cold beer and watch a favorite sporting event gets underway. The kitchen achieves it clean lines and uncluttered visual space through the suppression of “upper” wall cabinetry which gives the room an unusual feeling of lightness. Storage for china and crystal is astutely provided in under counter “garage” units clad in stainless steel. All counter surfaces in the Kitchen/Family Room are of either veined marble or Silestone and contribute to its sleek and elegant design. A long dining counter at the central island is a delightful place for a casual morning breakfast, and the spacious glass walled rotunda that overlooks the terrace and pool will no doubt be a preferred location for year round dining. Lighting is without question one of the most important elements in home design and the results here are nothing less than spectacular. Wherever possible, lighting comes from an indirect source: under counter, over beam, or from a cove; the entire home is bathed in a soft warm light that seems to appear magically. The home is designed for large scale entertaining and a second full-prep and cooking kitchen is located just beyond the Family Room. A gourmet Range, specially designed Wok burner and deep-fry unit, plus commercial size Sub-Zero refrigerator and freezer make this a very efficient auxiliary kitchen. It also serves as a pantry with abundant cabinetry for storage of crystal and china. This kitchen opens up to the oversized two car garage that features an epoxy floor and can be an excellent space where large scale events can be staged. A powder room with shower is also located in the kitchen wing and can be easily accessed from the pool area. A light filled mud room with long bench and under seat storage for children’s shoes and backpacks sits under a large skylight and is located just below the lovely stairwell that rises to the Master and family bedrooms. A suction-vac vent located across from the bench quickly eliminates any dust or sand that may have been tracked into the home. Returning to the Living room one passes a door concealed in a wall in the Entry that opens to reveal the lovely main powder room. All tile, wall colors and interior finishes adhere to the design thesis of restful colors and natural materials that are pleasing to the eye. 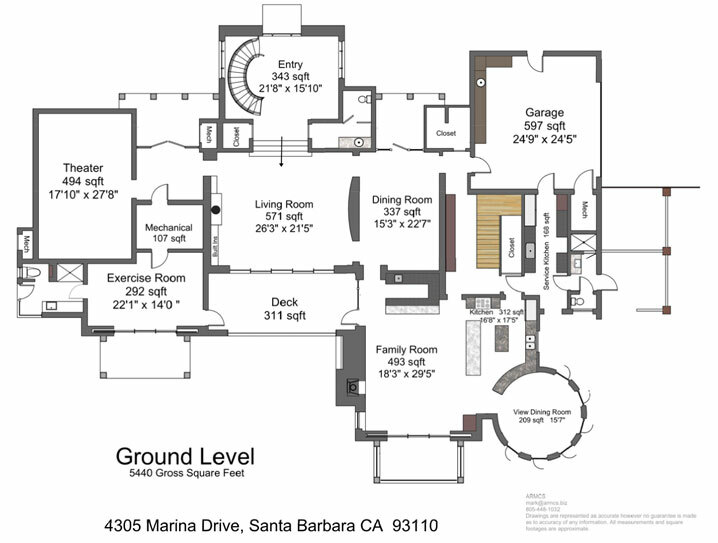 A spectacular multi-tiered home theater accommodates twelve movie enthusiasts in great comfort. The theater features Dolby/Atmos total surround sound that includes concealed ceiling mounted speakers and the high resolution image is provided through a 4K projector. The video screen is state of the art and automatically adjusts to all screen formats. The theater can be accessed by a separate glass door entrance that provides an additional level of privacy to the Living and Dining areas. A Zen-like mirrored Pilates, yoga and dance studio with wooden floors enjoys peaceful views across the lawns to water’s edge and is without doubt one of the most beautiful studios ever designed. It features an over-sized private bath and shower. The home is fully automated: heating, air conditioning, radiant heat (Living Room, Dining Room and Master bath), lighting, aquarium circulation pumps, window shade operation, fireplace activation and flame height, door locking systems, and whole-house reverse osmosis system are remotely controlled by tablet or laptop applications. While many homes today claim to be “smart”, this home takes that claim to an entirely higher level of quality. The central staircase, powder coated in a subtle stainless steel color, ascends to the private family rooms. Three handsomely proportioned family guest bedrooms feature partially vaulted hip ceilings with cove lighting. The design is unique and complements the innovative design of the home. In each room, large doors with minimalistic hardware open to reveal dressing areas. Bathrooms feature thematic glass tile walls that give a distinct character to each room. Floor to ceiling glass walls create the sensation of being cantilevered over the gardens and give the impression of floating over the landscape. Tilt/turn European window systems allow for two types of window ventilation. The bedrooms are thoughtful in design and utility, and their unique expositions give them a distinct sense of privacy and serenity. Two of the bedrooms are located near the second “family” stairwell and feature a common lounge area where friends can be entertained with television and video games. A large laundry room is also located on this level for ease of access to the family bedrooms. Perhaps the grandest room on this level is the sumptuous book lined private study. A large aquarium is the focal point of this “ne plus ultra” state of the art office. Pivot Door hinges allow the five hundred pound door to be opened with the touch of a finger. Views from the office balcony are endless and offer a welcome respite from the stress of international finance, or the deadlines of a successful screen writer; whatever the pursuit, this home office is without rival. A cedar deck leads directly from the office to the Master bath. This design element is intended for the financier who trades in real time on the Shanghai or Frankfort Exchanges and may need immediate access to the Office at any hour of the night. The Master suite has astounding views in all directions. The balcony, flanked by two graceful palms is intimate and inviting. The glass wall rotunda is a delightful sitting area; an ideal place to welcome the new day with a cup of expresso. A handsome fireplace adds a special ambiance to the room. The Master bath features long counters with dual vanities and the shower features both rain and steam options. The room also features Toto fixtures. Dark Ipe wood is used extensively throughout the bath and its rich dark patina is particularly effective. Located beyond the shower area is an exceptionally well designed dual walk-in dressing room. A closet in the bedroom can also be used as an additional dressing area if necessary. The highlight of the Master is a sculptural metal staircase that rises to the 3rd level “lookout” tower. Here a tall cedar hot tub sits under the open sky. To add to the exceptional serenity of the tower, the hot tub is jet-less with all mechanical equipment located on the ground level. With no sound from the circulation pump – the soaking experience under the brilliant star-filled Santa Barbara sky can be enjoyed in absolute silence; the only sounds that may be heard: a bird’s song carried on a gentle breeze or the crash of the waves as they roll in on the beach below. This spectacular tower offers 360 degree views over the entire property. The grounds that surround the home were planned with the same level of attention to detail as the interiors. A North/South championship tennis court is set naturally into the landscape below a glorious rose garden. A fruit orchard, green house and raised planting beds echo a theme of sustainability. The greenhouse was conceived as the nurturing environment for nascent seedlings before being transplanted into the raised planting beds of the Chef’s garden Pomegranate, avocado, papaya and myriad fruit trees grow joyously in the temperate Santa Barbara climate. Well established border hedging assures complete privacy for the residence. A workshop/ art-sculpture studio or auxiliary garage for the classic car collector is located near the fruit orchard. An Open trestle beam, galvanized steel ceiling sits under a massive skylight. The workshop features a 2000 lb. material lift, an epoxy floor and electrically operated window shades. The property is generator ready and the home was also designed for the eventual installation of solar panels. With a design that has anticipated every possible desire for comfort and elegance of living, where brilliant sunsets can be enjoyed while strolling the approximate 204 feet of ocean bluff, in gardens respectful of the need to conserve nature’s limited water supply, and on a private pathway that descends to the pristine white sands of Arroyo Burro –this landmark home will provide a refuge of elegance, refinement and beauty that will be a continued source of pleasure and pride. 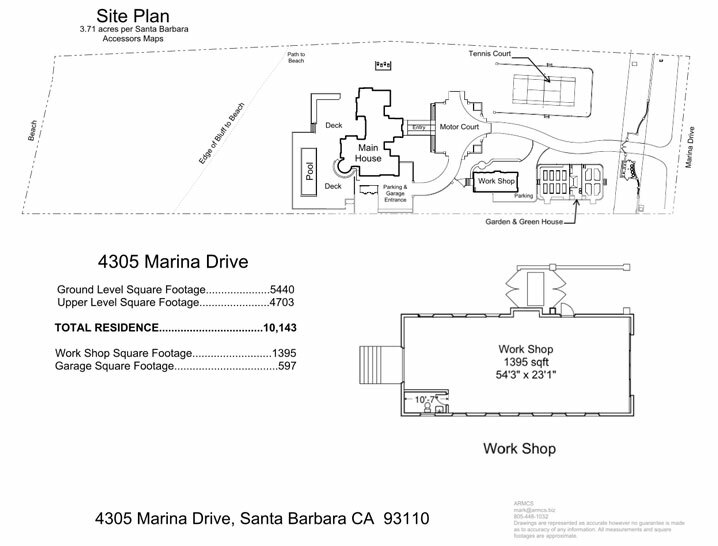 4305 Marina Drive now takes its just place among the architectural gems of Santa Barbara. Gary Takle of Australian based “Behind The Gates” discovers the Hope Ranch Bluff-Top Contemporary.